If you have a tattoo, you probably haven't thought about the fact that your artist spends hours hunched over your body holding a 20lb vibrating brick steady to give you the ideal artwork. The truth is, tattoo artists have an unexpected disadvantage from their work: severe back pain. While you sit or lie comfortably on a bed, they're putting their bodies through extreme stress. This isn't to say that you should feel guilty when getting a tattoo, but maybe tip your artist a little better to show your gratitude for their dedication. Why does giving a tattoo hurt more than getting one? A recent study from researchers at Ohio State University reveals that artists overexert their muscles. The constant strain goes well past the recommended point to avoid long term injuries. This comes as no surprise considering that many artists use hard stools and hunch over for hours at a time. Their health risks equal those of dentists and dental hygienists. However, unlike the dental industry, which has standard ergonomic guidelines for the workplace, the tattooing industry is one of the least regulated. 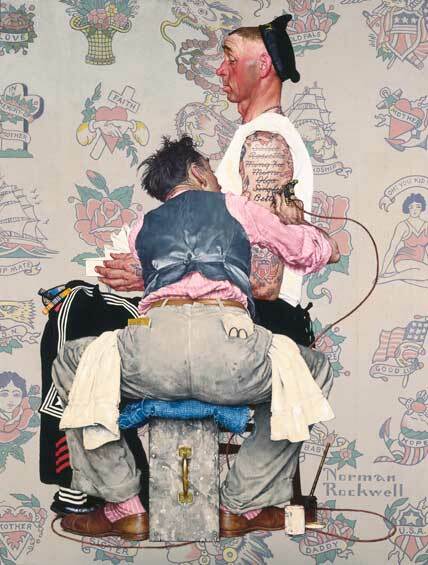 Despite the fact that 1 in 3 Americans have a tattoo, the industry itself is very unregulated. This lack of regulation stems from the fact that most shops are small businesses, not large companies. What exactly about tattooing hurts the artist? The posture, lack of ergonomics, and static position all strain the joints and muscles. This strain for extended periods of time leads to chronic pain and health issues such as cervical spondylosis. Tattoo artists regularly experience pain along their fingers, hands, wrists, forearms, elbows, shoulders, neck, spine and lower back. Essentially, their entire upper body is in constant strain. This strain results from the physical act of sitting and tattooing. While working, an artist typically bends over the customer, extends their arms, and makes small, repetitive motions for hours at a time. Some might say this just comes from doing the job, but many professionals have tips and tricks to help with this strain. Renowned tattoo artist, Guy Aitchison, has a solution to prevent a lot of this strain from occurring. He recommends sitting "like a beanpole" with a strong, centered gravity. A good center of gravity comes from the head being centered over the hips. Furthermore, Guy suggests good equipment which won't require as much bending. For taller artists, the client should be in a higher chair while the artist's chair is low to the ground. He also stresses the importance of a good ergonomic setup. One great product is renowned ergonomic chair, the Herman Miller Aeron. This chair not only sinks pretty low, as Guy recommended, it also provides the best lumbar support. This, in turn, encourages correct posture while sitting. The only downside: the price. A brand new Herman Miller Aeron Fully Loaded will set you back $1,068. Fortunately, Beverly Hills Chairs?offers refurbished Herman Miller chairs for a reduced price. You can get a great chair without breaking the bank! Fixing your posture doesn't solve every risk when tattooing. The tattoo shop environment is rarely ergonomic. Like any other retail spot, most shop decor focuses on what will attract clients over ergonomic benefits. This especially applies to tattoo shops because the client has to be comfortable getting needles stuck in their body. Shops often place ambiance over the artist's needs for their workspace. This can result in poor lighting and lack of space to work with. Markus Lenhard, an artist who specializes in biomechanic, abstract, and organic tattoos, has several suggestions for improving ergonomics in the tattoo shop. His first piece of advice: invest in good lighting. If the shop's light fixtures don't supply enough, get a flexible lamp. Furthermore, many little accessories help support the body outside of the ergonomic chair. Markus recommends step stools and arm rests to fully support your weight while tattooing in tricky spots. Markus also attributes most of the pain that comes from tattooing to the machine's footswitch. He transitioned to an on/off button, allowing him to remove his foot from the unsupportive footswitch. Not only does this let him keep his foot in a stable position, it also reduces the amount of wires from the machine to a single one. His final piece of advice: get a workstation on wheels over a fixed table. A movable workspace provides better adjustability and more accommodation for the artist. The final and perhaps largest source of tattoo artist muscle and joint pain is the fact that they don't move for long periods of time. It's quite difficult to catch a break in the middle of a long session. However, chances are your client also needs a break from their skin being carved. When it comes to long sessions, giving them a needle break will also give you a break. During this break, you can stand up and move around and stretch your sore muscles. It is also a good idea to stretch before and after every session. Outside of stretching, make sure to adjust your position often. This changes blood flow and moves the stress to different areas. You should also find times throughout the day to walk around and increase blood flow to the spine. Not only do you want to get your 10,000 steps a day, having more muscles will stabilize your body better. Another great way to build muscle is by taking a yoga class or working out more. Being more healthy in any way will improve the way the body reacts to extended periods of sitting. Alternatively, one great product to generally increase movement around the shop is a Sit to Stand Desk. These desks will allow artists to draw standing up or sitting and encourage more movement around a space. If you're already standing, you are much more likely to go grab something instead of putting it off. It's not uncommon for an artist to push themselves in order for the client to be comfortable and happy. Artists dedicate themselves to creating great work for their clients. But they shouldn't have to put the client above themselves, the solutions mentioned in this article will greatly decrease stress on the body.